Grilled Mixed Berry Crisp: Vegan. Gluten-Free. No Bake. 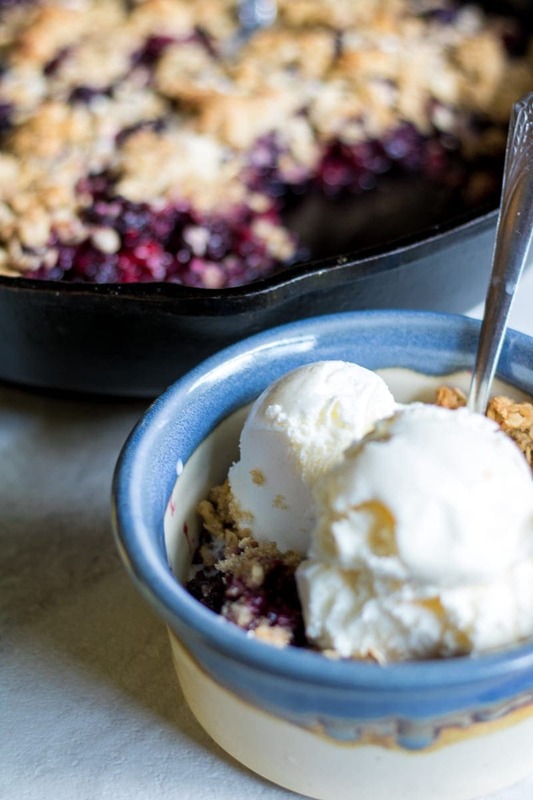 Grilled Mixed Berry Crisp: Juicy, plump blackberries and raspberries combine with sweet and crunchy crisp topping, to create one easy and satisfying summer dessert–no oven required. Are you all as in love with summer produce as I am? I find myself over-doing it a bit on my produce purchases with all the fresh and ripe selections from my local farmers market. Let’s see there are peaches, watermelon, sweet corn, vine-ripened tomatoes, mangoes, and berries–lots of berries. We are not lacking in our daily consumption of fruits and veggies at this house! To be honest, we eat most of our produce, unadulterated. There is a handful of watermelon here, some berries snacked on in late afternoon, etc, etc! However, my creative little brain is always thinking about ways to turn this produce into more than just a snack. How about mangoes in guacamole, tomatoes layered in quinoa, fresh pineapple grilled with chicken….the list could go on and on and on. And hopefully the recipes I produce will go on and on for you as well! This past week, I found myself in an effort to clean out the fridge and freezer BEFORE making a run to the grocery store for minimal necessities. We have been preparing to move and it is amazing what I have on hand that I need to use up! I had some fresh blackberries, blueberries, and frozen raspberries. I also had a stash of my homemade granola in the pantry, and a half gallon of our favorite all natural vanilla ice cream in the freezer. Sounds like the makings of a good crisp to me! Oh, but it was 100 degrees–I certainly did NOT want to turn my oven on. What about grilling the crisp alongside of the burgers I was making for dinner? Deal sealed! I was gonna grill a crisp. Let me say this is pretty awesome as is and then it is dairy-free, gluten-free, egg-free, and vegan. But top it with your favorite ice cream, and oh man!! It is a PERFECT dessert for summer! If you find yourself in the mood for a traditional apple crisp, and I mean, who wouldn’t find themselves in that predicament as soon as fall temperatures hit, try out Healthy Seasonal’s Maple Apple Crisp. 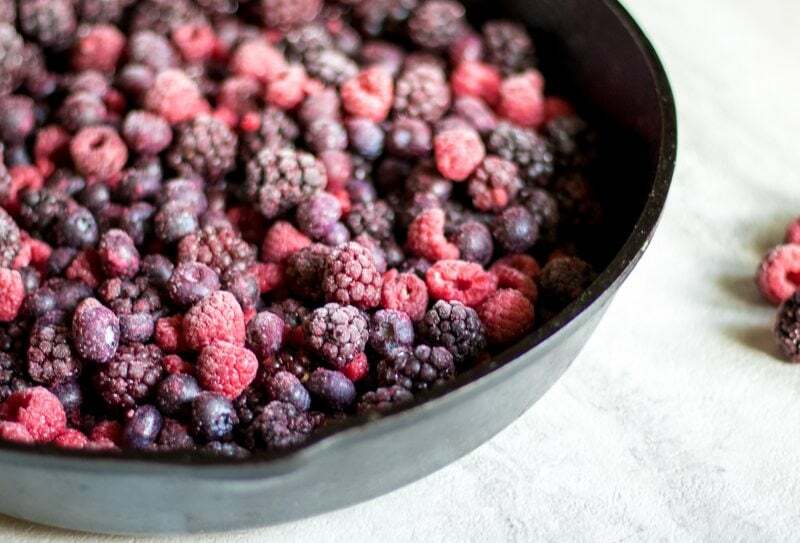 Sweet berries are topped with a homemade crisp and grilled to perfection for a fun twist on dessert that keeps the heat out of the kitchen. Combine berries, maple syrup, lemon juice, and cornstarch together. 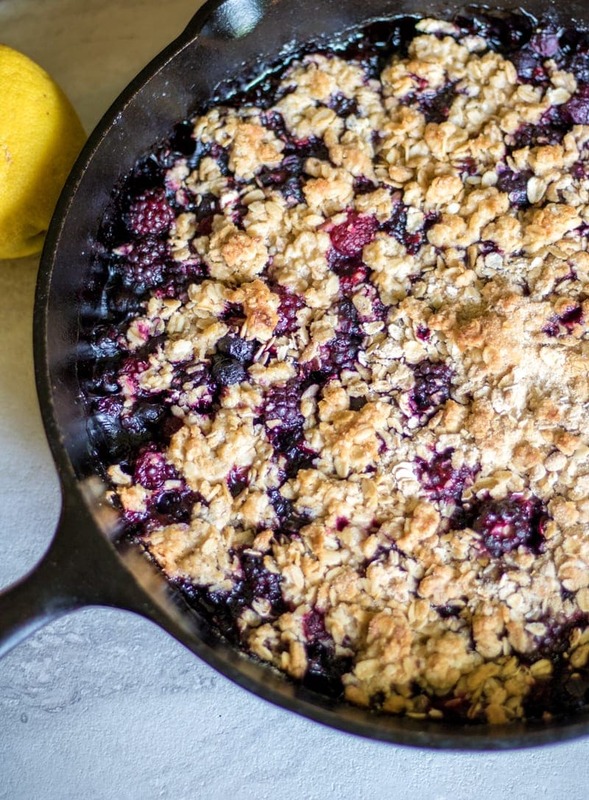 Pour into a cast iron skillet, or grill safe pan. I greased my cast iron skillet with butter. Replace butter with coconut oil to keep this dish vegan. Crumble the granola over the top of the berries evenly and cover with foil. Place on the grill. Cover the grill and cook anywhere from 20-30 minutes. My crisp was bubbling and hot at 20 minutes, but this will depend on your grill's heat and level of your flames. Serve plain, with whipped cream, yogurt, or ice cream. *Remember you can use any berries you like. I used 12 ounces frozen raspberries combined with 1 pints fresh blackberries and 1 pint blueberries for a total of about 6 cups. What is your favorite UNEXPECTED thing to grill? So delicious Kristen! I love this crisp on the grill!!! Also the maple syrup. Fresh berries are so wonderful this time of year. I really feel as if I need to invest in a frying pan like you have. I don’t have one. This recipe looks divine. 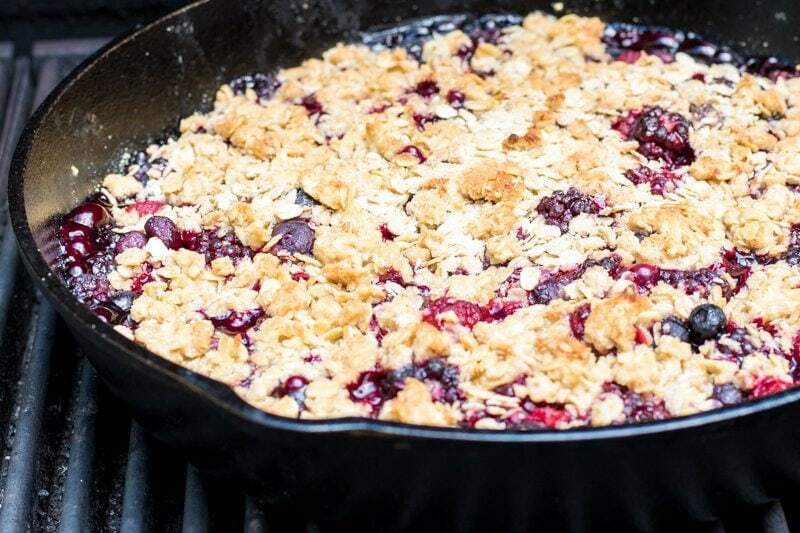 I need to get out the cast iron skillet and make your mixed berry crisp. 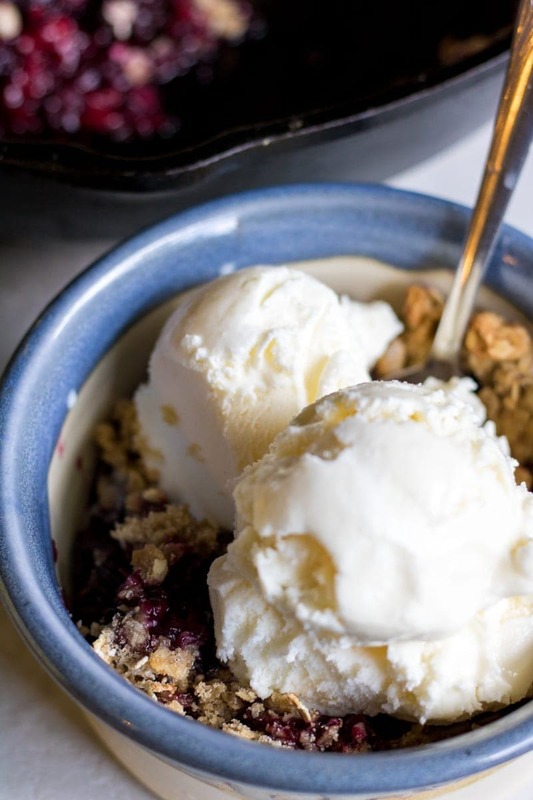 Berry cobblers and crisps are my favorite desserts and when you can use fresh berries, yum, that’s even better. Looks yummy! Amen–it is WAY too hot to turn the oven on in the summer! This is perfect for summer! I’m having a picnic next week and will be using this recipe!! Awesome Caroline. It is the perfect dish for a picnic. I hope you enjoy! Great post! I love the idea! I love out of the box recipe ideas like this. Something that’s typically made in the oven when it can be made outside and not heat up the kitchen = perfect! Thanks Christine. Grilling this works fabulously! Can I have this right now? Dessert for breakfast is okay with it’s fruit right? Well, I hope you can get yourself a grill one day. I love that you were ready to make a stew on the grill during a power outage. I may have to try that! I LOVE easy summer dessert for entertaining – what could be better than using the grill when it is already hot! 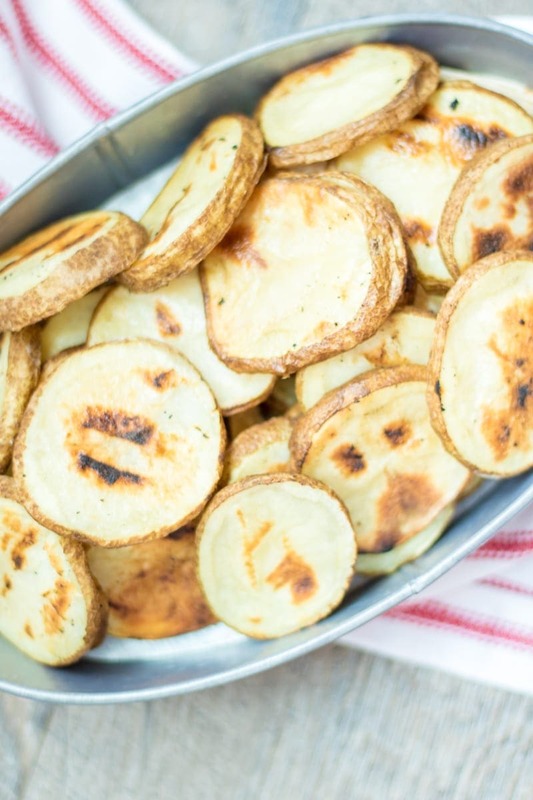 so easy and so perfect for summer season! This looks so good! I bet it gets a little bit of a smokey flavor from the grill. It does Rachel–and it is so good! WHO knew that berries could look SO yummy grilled? 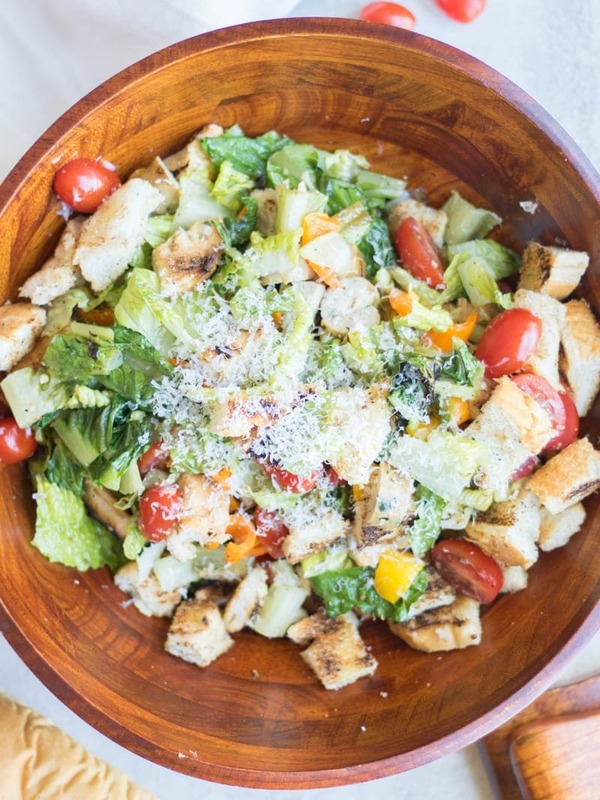 bookmarking this recipe! Thanks Rebekah! You will love it! I have never seen a grilled crisp! So creative. It looks fantastic. This looks amazing! Just pinned it for later 🙂 Thanks! This looks amazing! I love dessert done on the BBQ. You get all the best part of dessert, without the heat in your kitchen warming up the house on a summer day! This looks amazing! Cherry crunch is one of my favorite desserts. I have been trying to come up with a healthier version and this is perfect! 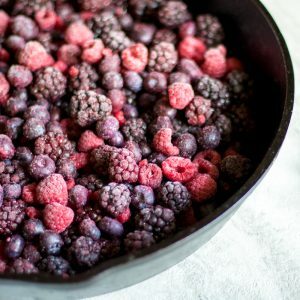 I love berry crisps, especially during the summer, what a great idea to make one on the grill, it sounds delicious! Thanks Joy….this crisp is one of my new favorites. This looks AMAZING. Going to have to try it soon! I swear anything cooked in a cast iron skillet is automatically delicious. 🙂 Great job! I agree, a cast iron skillet adds something to so many dishes! This look absolutely amazing. I pinned it twice and am bringing this to my parent’s for the holiday! PERFECT timing. Yum! Ahh Thanks Erica!! I hope your family loves it as much as we did! Wait what just happened? This looks like the most delicious and healthy dessert ever. I can’t wait to make this!!! Love this (even through my green colored grill envy glasses!) I’ve been having a hard time adjusting to how much quicker produce goes bad in the summertime. Great to have some use-it-up-fast recipes to turn to. Thanks for linking up to #SaucySaturdays. Isn’t it crazy how much quicker produce spoils in the warmer months? I am always looking for ways to put it to good use! I just picked 15 quarts of blueberries so I think I might make this with my haul! What a quick and easy treat for summer! This is exactly the recipe you need for those blueberries Jennifer–and I will gladly come take the ones you can’t put to good use. YUM! Grilling in a skillet is always a hit! 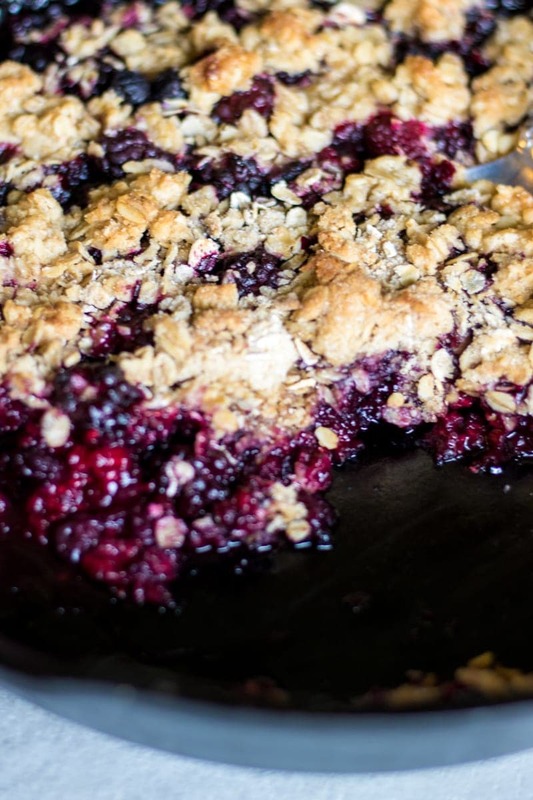 Your grilled mixed berry crisp looks amazing! Love how wholesome and naturally sweet this crisp is! Maple syrup is the best! I agree–maple syrup is the best. Especially when it comes from my husband’s family farm. What a great idea! 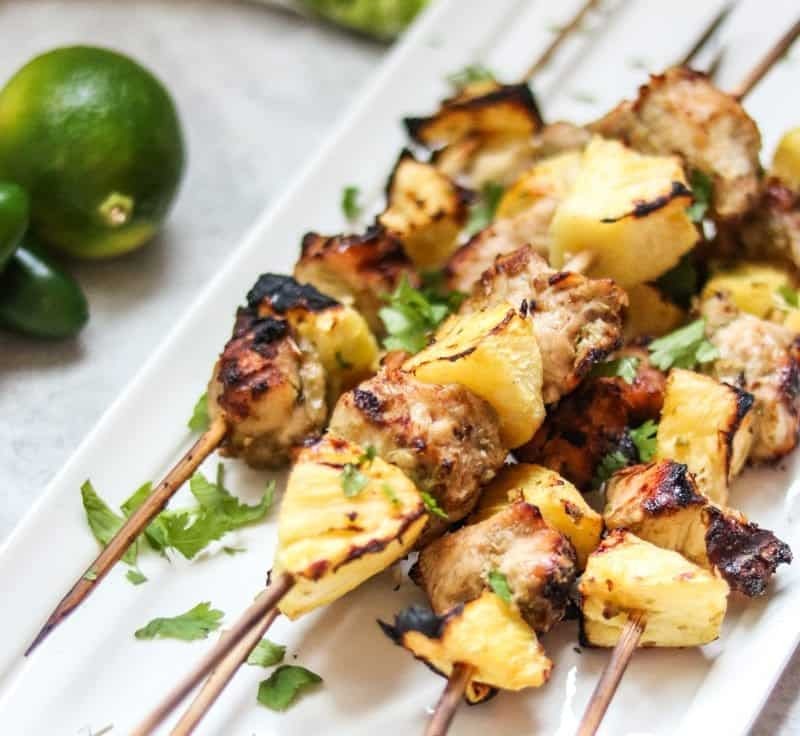 You can make your whole meal on the grill! Yes, which makes for very little clean up = mom win! The berries look so pretty after grilling!! Thanks and they taste even better! I love grilling but for some reason I never think about grilling dessert! I need to try this recipe! Girl, you need to GET on it!!!! Grilling fruit is just incredible.